Orders must be received in the Home Office from noon, CDT, December 1 through noon, CDT, January 1, 2018. Note: Products and colors in packages are predetermined and may vary based on inventory availability. 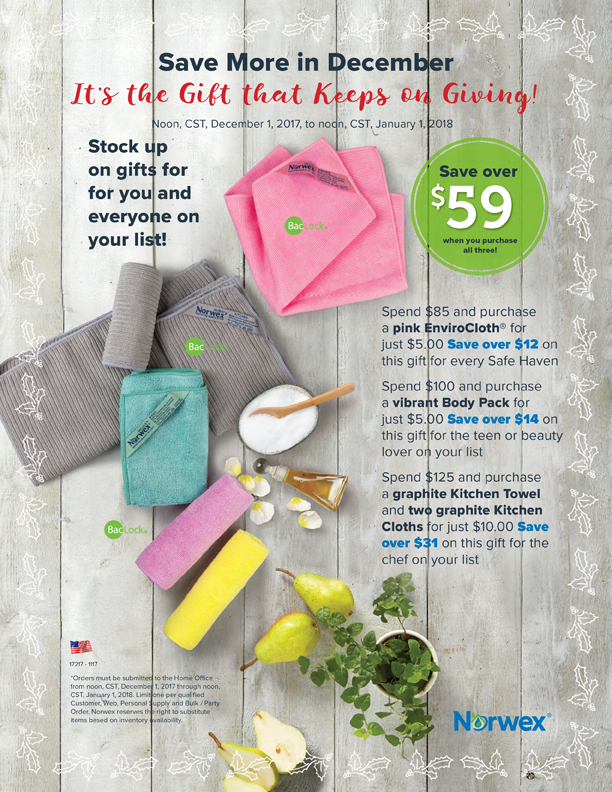 Stock up on gifts for for you and everyone on your list! It’s the Gift that Keeps on Giving! 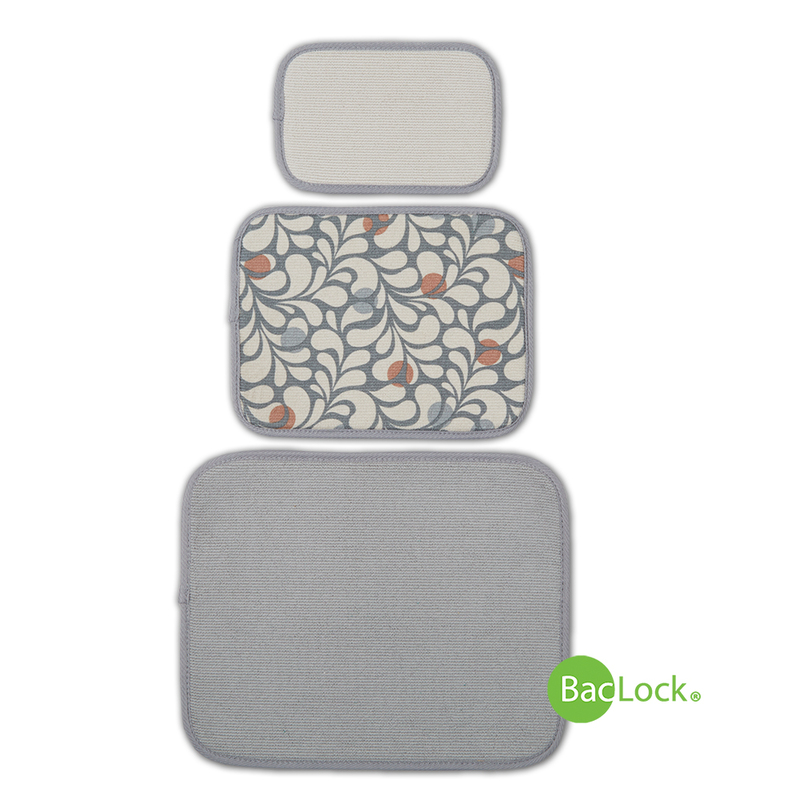 Save over $59 when you purchase all three! Spend $85 and purchase a pink EnviroCloth® for just $5.00 - Save over $12! 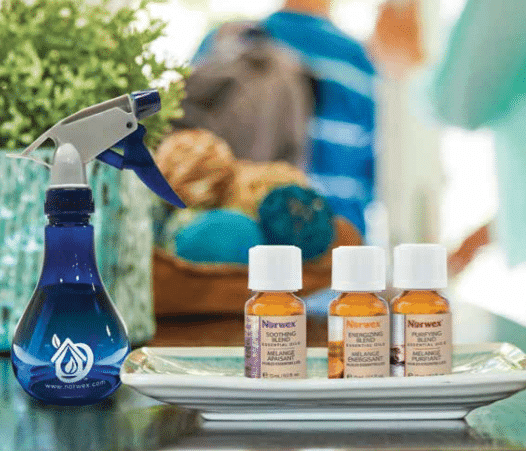 Spend $100 and purchase a vibrant Body Pack for just $5.00 - Save over $14! 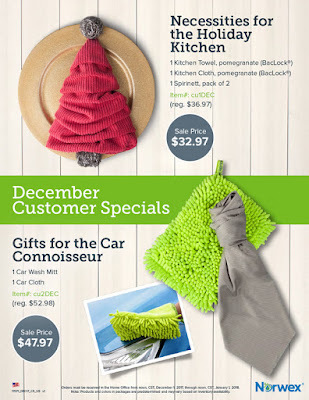 Spend $125 and purchase a graphite Kitchen Towel and two graphite Kitchen Cloths for just $10.00 - Save over $31! *Orders must be submitted to the Home Office from noon, CST, December 1, 2017 through noon, CST, January 1, 2018. Limit one per qualified Customer, Web, Personal Supply and Bulk / Party Order. 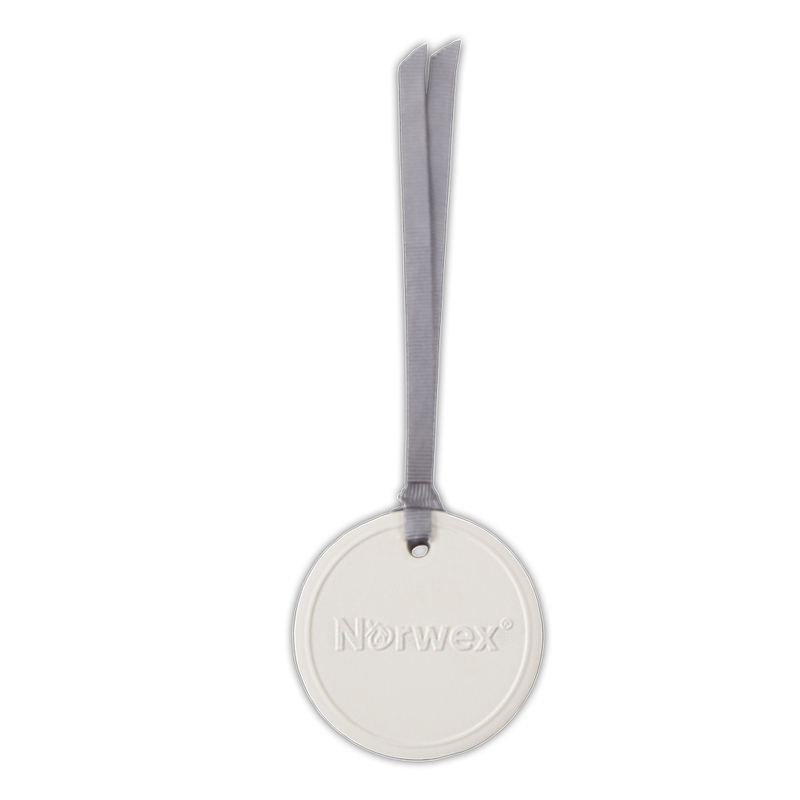 Norwex reserves the right to substitute items based on inventory availability. PLUS $25 EXTRA HOST CREDIT! 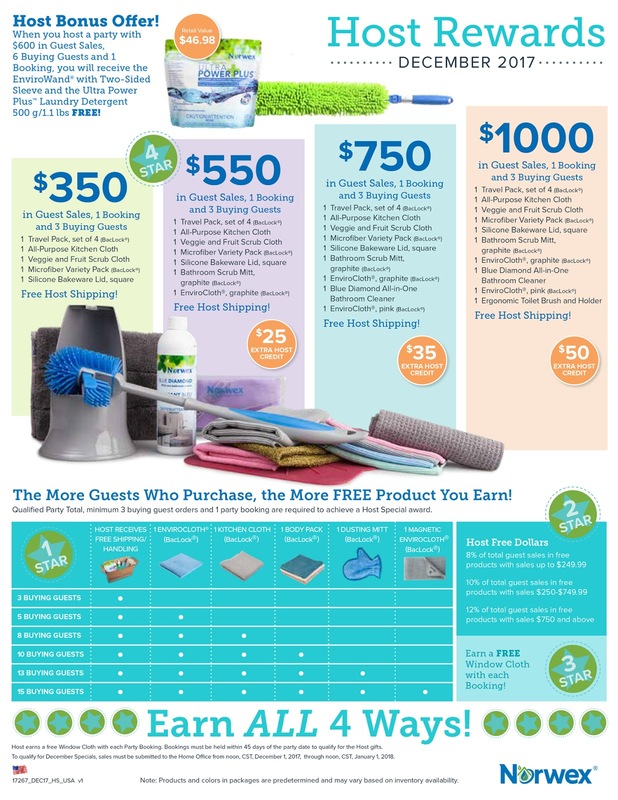 When you host a party with $600 in Guest Sales, 6 Buying Guests and 1 Booking, you will receive the EnviroWand® with Two-Sided Sleeve and the Ultra Power Plus™ Laundry Detergent 500 g/1.1 lbs FREE! PLUS $35 EXTRA HOST CREDIT! 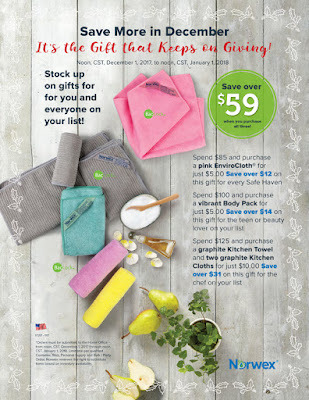 PLUS $50 EXTRA HOST CREDIT! All parties must be submitted to the Home Office from noon, CST, December 1 through noon, CST, January 1, 2018. 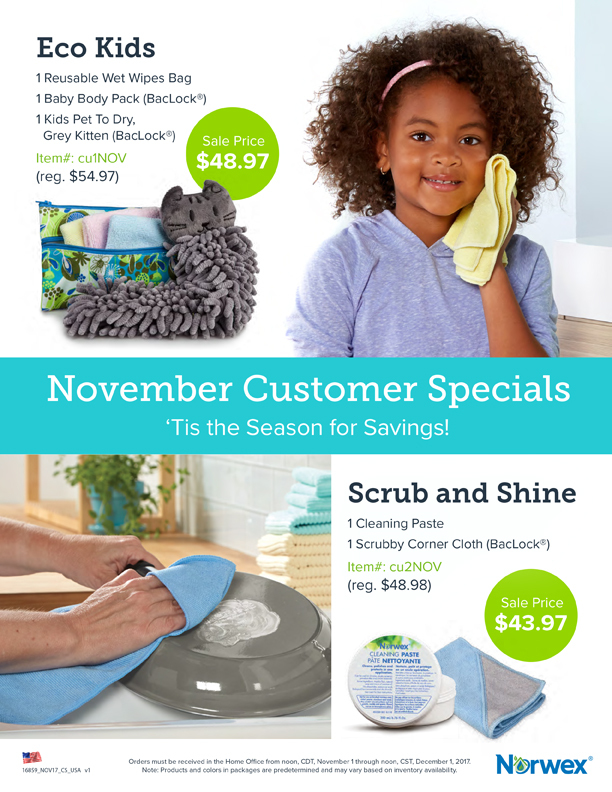 Join Norwex in November and Earn a Limited-Edition Grey Chevron Set! 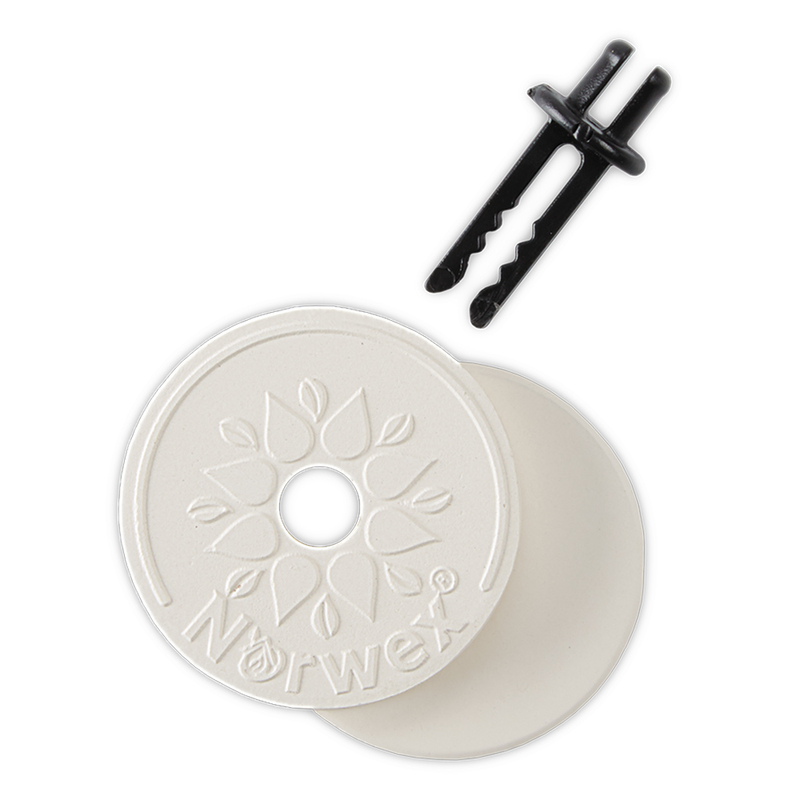 The generosity of Norwex always amazes me. Fall is such a wonderful time to consider this business opportunity. 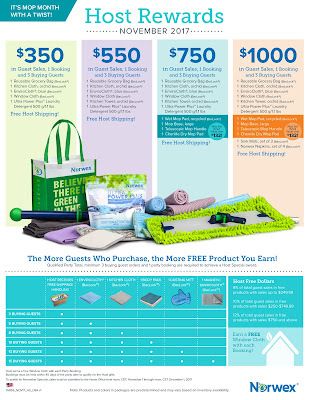 When you join my Norwex team in November, you're also eligible to earn hundreds of dollars of FREE Norwex! Our Party Starter Kit (http://www.fastgreenclean.com/2017/02/start-your-norwex-business-join-my-team.html) details your kit products and upgrade options, and during November you have the opportunity to earn some limited-edition products as well! 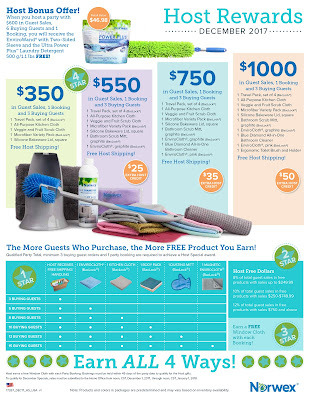 If you're looking to make changes in your home to reduce toxic chemicals, I'd love to chat with you about this offer. If you're trying to make a little extra spending money for the holidays, I'd love to chat with you about this offer. 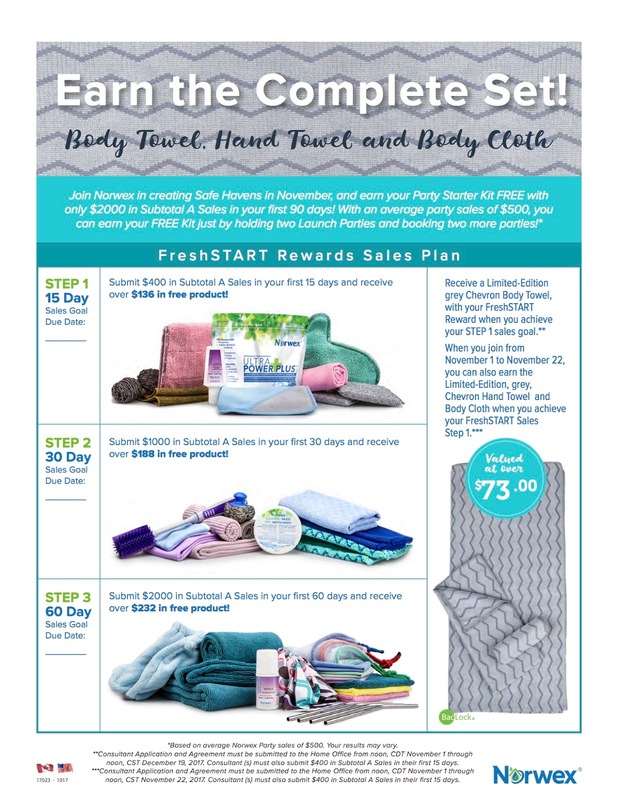 If you already love Norwex but can't quite commit to the business side of it, I'd love to chat with you about this offer. 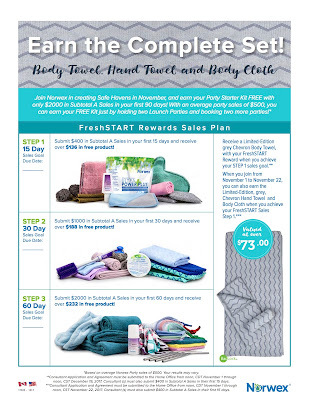 Earn the Grey Chevron limited edition Norwex body towel, hand towel, and body cloth set! *Based on average Norwex Party sales of $500. Your results may vary. **Consultant Application and Agreement must be submitted to the Home Office from noon, CDT November 1 through noon, CST December 19, 2017. Consultant (s) must also submit $400 in Subtotal A Sales in their first 15 days. ***Consultant Application and Agreement must be submitted to the Home Office from noon, CDT November 1 through noon, CST November 22, 2017. Consultant (s) must also submit $400 in Subtotal A Sales in their first 15 days. Orders must be received in the Home Office from noon, CDT, November 1 through noon, CDT, December 1, 2017. Note: Products and colors in packages are predetermined and may vary based on inventory availability. 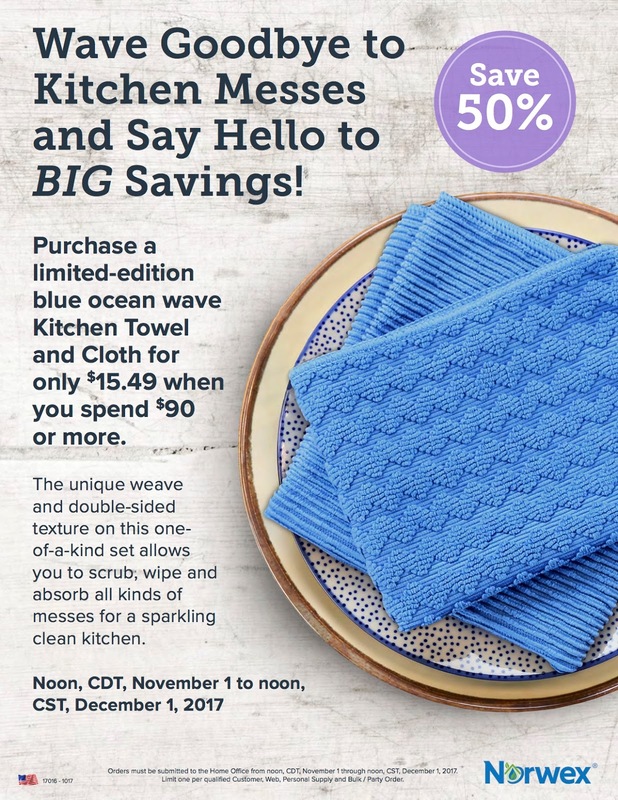 Wave Goodbye to Kitchen Messes and Say Hello to BIG Savings! 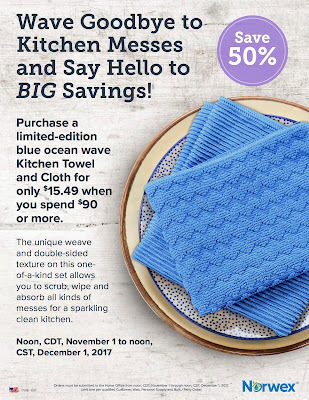 Purchase a limited-edition blue ocean wave Kitchen Towel and Cloth for only $15.49 when you spend $90 or more. 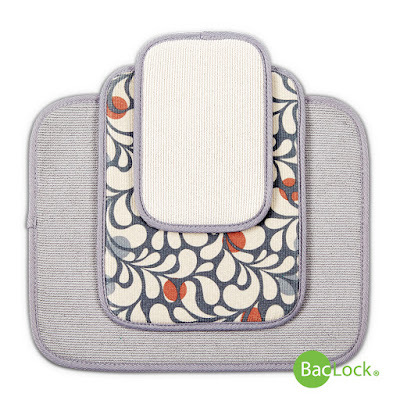 The unique weave and double-sided texture on this one- of-a-kind set allows you to scrub, wipe and absorb all kinds of messes for a sparkling clean kitchen. Orders must be submitted to the Home Office from noon, CDT, November 1 through noon, CDT, December 1, 2017. Limit one per qualified Customer, Web, Personal Supply and Bulk / Party Order. *Products and colors in packages are predetermined and may vary based on inventory availability. 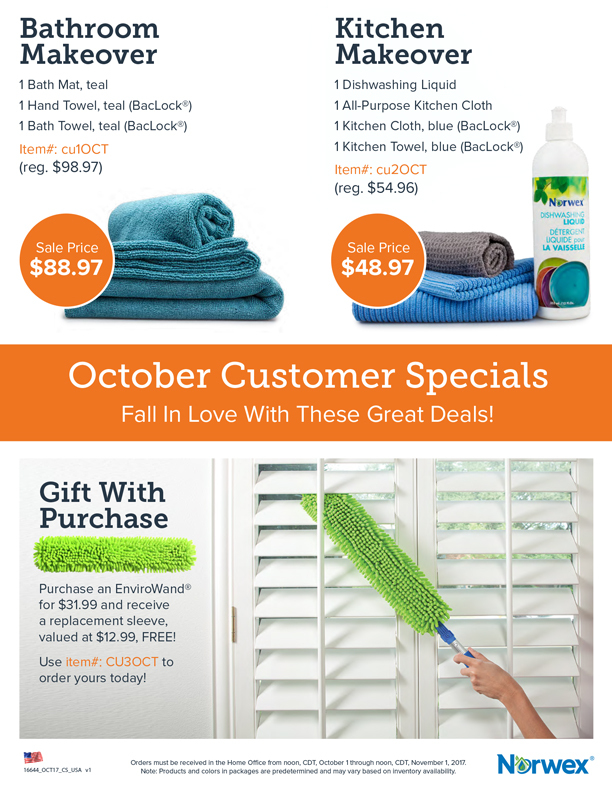 It's Mop Month - with a twist! "Mop Set" Retail Value over $132! All parties must be submitted to the Home Office from noon, CST, November 1 through noon, CST, December 1, 2017. P R O B L E M : You want to get rid of bad odors and keep your home smelling fresh without the use of harmful chemical-filled sprays and cleaners, but finding healthy, natural alternatives can be challenging. S O L U T I O N : Enjoy wondrously fresh smells as you infuse a soothing scent throughout your home. 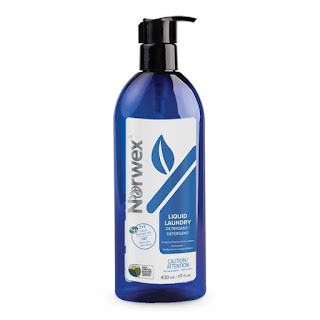 With rich, natural Norwex Essential Oils, you can provide a delicate aroma to your Safe Haven! 15 ml / .5 fl oz. • Spritz on surfaces and wipe down with your Norwex Microfiber cloths to scent your home simultaneously while cleaning. • Some studies suggest that several essential oils like those extracted from Lavender, Rose, Orange, Bergamot, Lemon, Sandalwood and others have been shown to help relieve anxiety and stress. Essential Oils can be irritating to skin so they are not recommended for topical or oral use. Flammable; keep away from flames or sparks. Many aerosol sprays and scented candles contain harmful chemicals such as formaldehyde and phthalates. 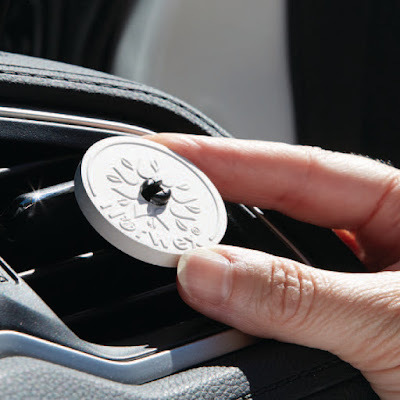 Ceramic is a great diffuser for essential oils, the perfect way to lightly scent the air in your home, car, travel trailer— anywhere. Both products provide a light, fresh scent. Purchase an EnviroWand® for $31.99 and receive a replacement sleeve, valued at $12.99, FREE! Orders must be received in the Home Office from noon, CDT, October 1 through noon, CDT, November 1, 2017. Note: Products and colors in packages are predetermined and may vary based on inventory availability. 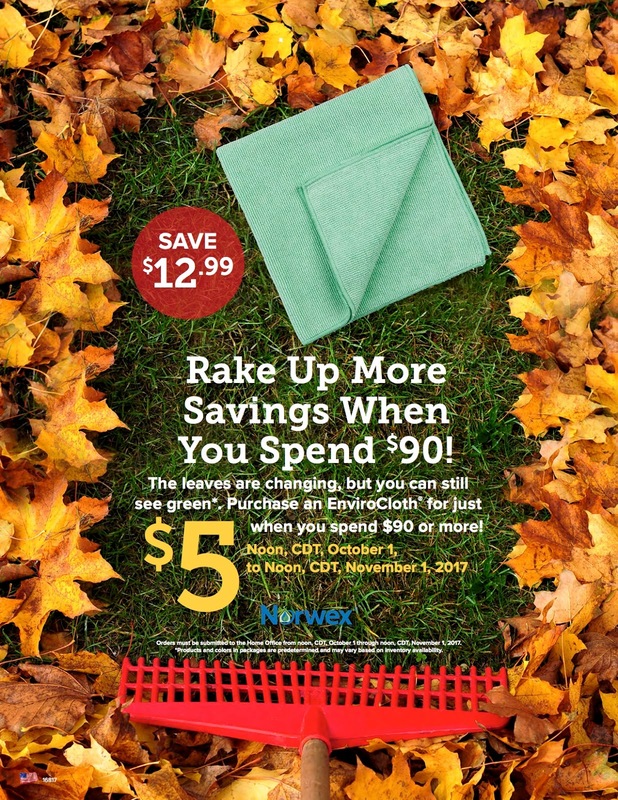 Rake Up More Savings When You Spend $90! The leaves are changing, but you can still see green*. 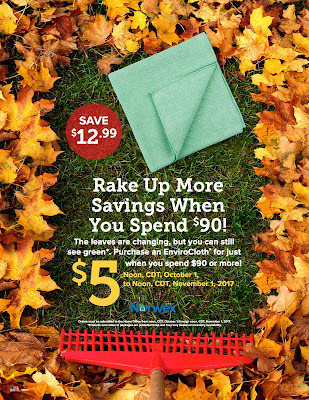 Purchase an EnviroCloth® for just $5 when you spend $90 or more! Orders must be submitted to the Home Office from noon, CDT, October 1 through noon, CDT, November 1, 2017. 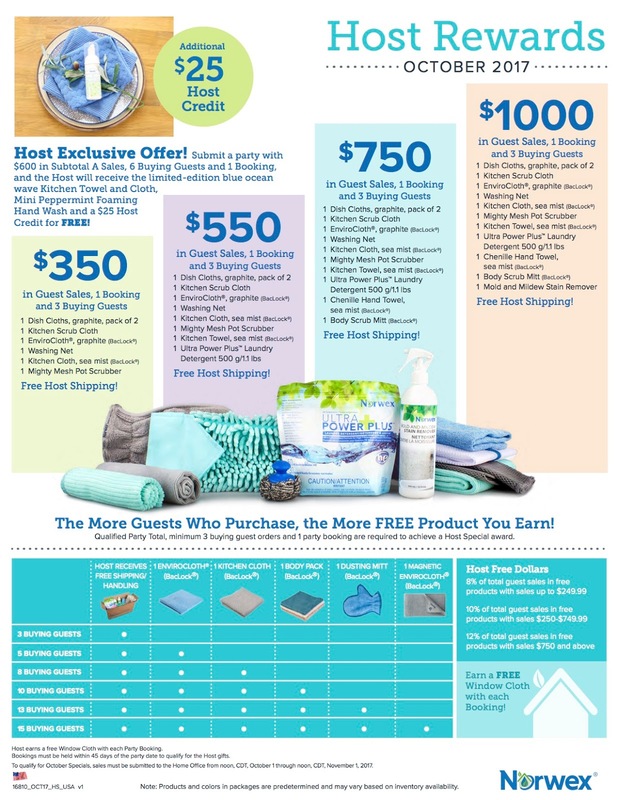 Submit a party with $600 in Subtotal A Sales, 6 Buying Guests and 1 Booking, and the Host will receive the limited-edition blue ocean wave Kitchen Towel and Cloth, Mini Peppermint Foaming Hand Wash and a $25 Host Credit for FREE! All parties must be submitted to the Home Office from noon, CST, October 1 through noon, CST, November 1, 2017. Enzyme power boosters reduce strong odors and tough stains. fat-based stains, like those from gravy, oils, grease, makeup, etc. Requires just a fraction of the amount of most typical store brands. One bottle of Liquid Laundry Detergent handles three times as many loads as a 46-ounce jug of a typical, chemical-laden laundry detergent. Using less means you save money— one bottle washes up to 215 loads in an HE machine and up to 107 laundry loads in a conventional machine. 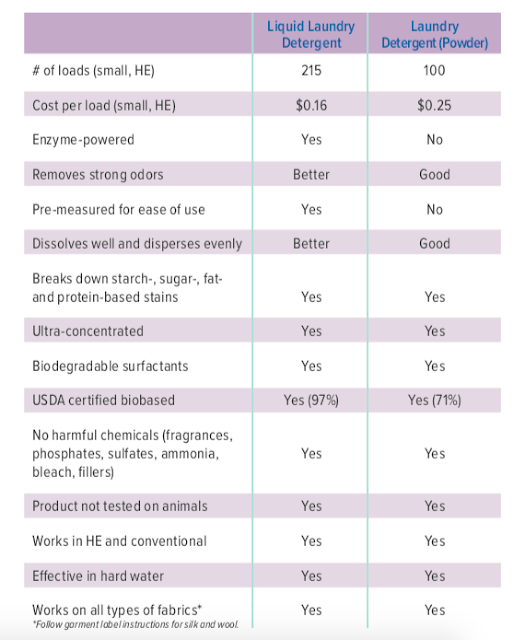 Unique enzyme blend contains biodegradable ingredients. Convenient pump bottle prevents spills and messes. Pump dispenses a consistent amount every time, eliminating guesswork. 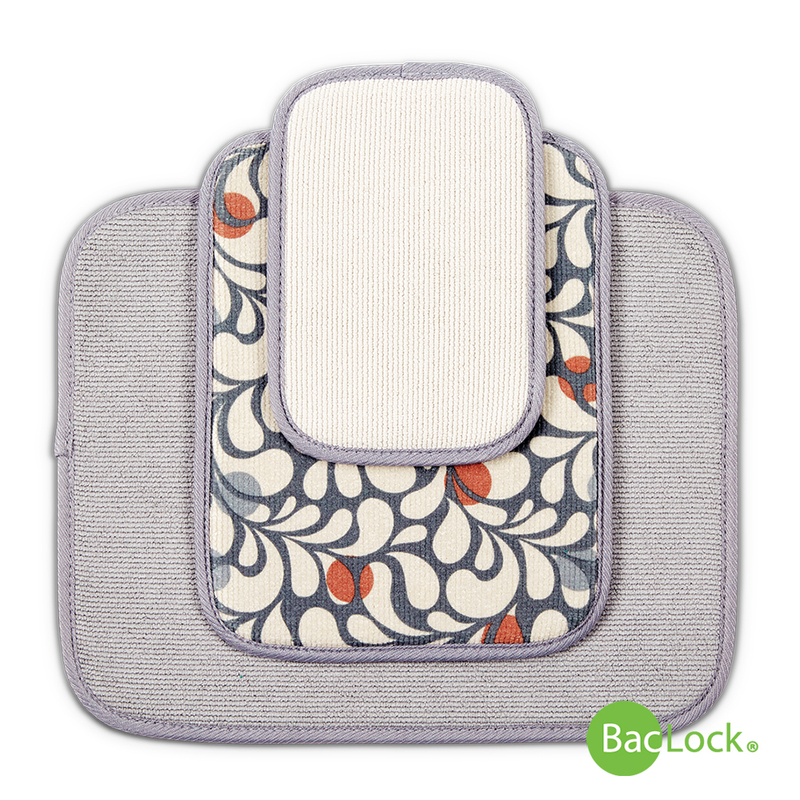 Eliminates the problem of heavy, drippy, messy detergent jugs in the laundry room. Bottle is recyclable, HDPE #2. Do not use with wool or silk fabrics. Enzymes are catalysts and function similarly to the way they do within our bodies—quickly breaking down starches, fats and proteins. This makes them very effective at removing grass, sweat, blood and grease stains and more. The major fillers used in most powder detergents are insoluble materials that cause accumulation and buildup in washers, pumps, pipes, drain lines and septic tanks—and they can also end up in our waterways. Liquid Laundry Detergent dissolves completely and does not accumulate or build up.